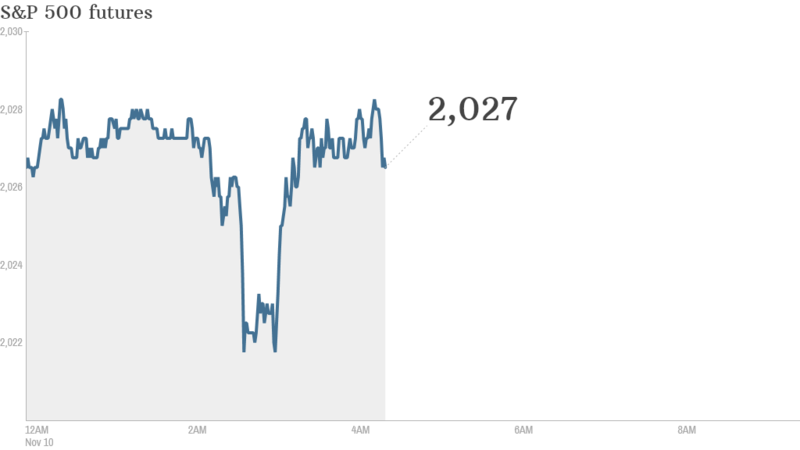 Here's something to perk you up on a Monday morning: stocks are heading higher again. 1. Time for a new record? : U.S. stock futures are inching up, and if the positive sentiment continues we'll probably see new record highs today. On Friday, the Dow Jones industrial average eked out a gain of 19 points and ended the week at its highest-ever closing level. The S&P 500 also closed at an all-time high. A number of experts surveyed by CNNMoney think the rally will continue as the year draws to a close. The latest reading from the CNNMoney Fear & Greed index shows market sentiment is neutral, with a slight bias on the greedy side. That is a far cry from the extreme fear investors felt in October. Related: Can this epic stock comeback continue? 2. Earnings: A number of companies will be reporting quarterly results Monday. Sotheby's (BID) is among the big names reporting before the opening bell. 3. International overview: European markets were all rising in early trading. The Russian ruble staged a 3% rebound after falling by roughly 30% this year versus the U.S. dollar. Traders gave the currency a boost after the Russian central bank reiterated that it stood ready to intervene in markets to ensure financial stability, while allowing the ruble to trade freely. It also pushed back its target for cutting inflation to 4% by a year to 2017. It now stands at more than 8%. Bloomberg reported that the bank had cut its forecast for Russian growth to zero for 2015. 4. Shopping bonanza: In China, investors and consumers are gearing up for China's biggest online shopping bonanza of the year on Tuesday. The holiday, called "Singles Day," started as a way to celebrate single people. It's now morphed into a multi-billion dollar e-shopping frenzy that attracts all kinds of buyers. Much of the trade takes place on Alibaba's (BABA) platforms.